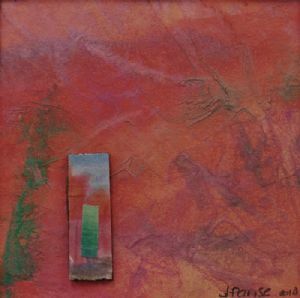 Artist Bio Joanne grew up in Southeastern Massachusetts, attended school and lived in Boston before relocating to New Hampshire in 1980. She has been an educator for many years in various capacities, with a strong interest in diverse learning styles. In My Own Words My turkey never looked like the teacher's. My snowman didn't even look like the teacher's. And there was always the unspoken message that they were supposed to. After years of thinking my hand could not do what art required, I began to explore my own visual world, learning to see, connecting with, trusting what was inside instead of looking outside of myself. Although I do not have any formal art training, the visual arts have always been a significant part of my life as a spectator and across the past several years, as a participant. Visual literacy has its own process, not unlike writing. Playing with paper, paints, mixed media, and fiber art nourishes me. Along the line, my visual voice has developed. Discovery is where I like to live.